I love food. And I love decision-making flow charts, they’re kind of the modern version of the ‘choose-your-own-way’ books, which I also loved. What happens when you mesh them together? 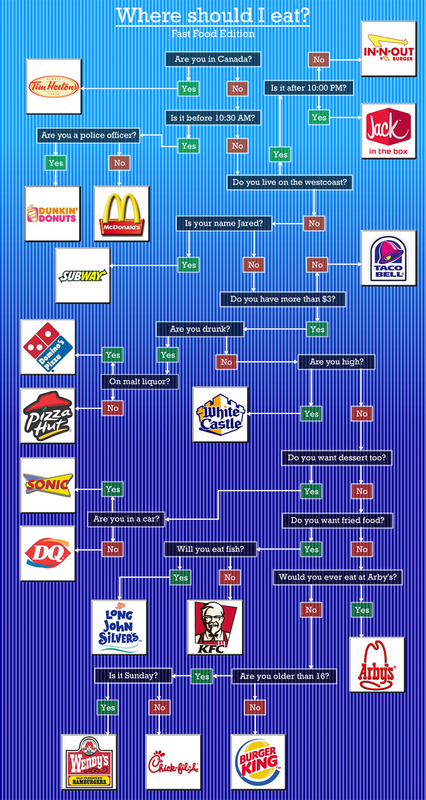 You get a pretty sweet flow chart that I will now have saved in my iPhone for the times where I just can’t decide where to eat if my refrigerator is empty and I’m in the mood for junk. Holla back at In-N-Out and Jack In The box as the top choices! Obviously some of the choices won’t apply to some of you. But Enjoy!